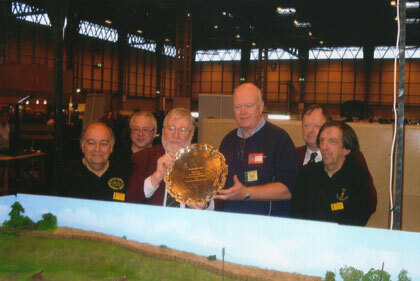 The 2011 winners of the LMS Society's Trophy at the Warley Model Railway exhibition held at the NEC Birmingham on Sat-Sun 19/20 November, was adjudged to be the Warley club's 'Broom Junction' layout, which was operated throughout the exhibition in the LMS period. Modelled on a realistic single track line, it performed to a high standard commensurate with it portraying a busy LMS country branch location, and as will be seen in one of the pictures, coal trains were one of the mainstays for this branch. The Judges comments - "A number of layouts were set in the LMS 1923-48 period, and they, along with a variety of eligible high standard individual LMS locomotive and rolling stock exhibits, were therefore eligible for the LMS Society Warley Trophy. David Hunt and Nelson Twells looked around 'everything LMS' several times on both days, before comparing notes, and deciding that the Warley Clubs' ex-MR & SMJR Broom Junc. layout had all the necessary characteristics they believed necessary for an award winning layout....quality modelling, accuracy of layout and models to prototype, realistically operated, and overall presentation to the public." The judges also stated, that the general standard seen on LMS layouts, and in many individual LMS exhibits, including individual rolling stock items, was to a generally high overall standard, and all were in serious contention for the LMS Society award. The faithfully modelled to scale length, Broom Junction station in Warwickshire, on the Midland line from Barnt Green in the north, to Evesham, at the junction with the Stratford-on-Avon and Midland Junction line to Stratford. GWR lines were only a short distance Broom, and the presence of one of that Company's motor vans seen leaving the station yard, was likely to have happened in the LMS period. The layout has a good stretch of track, allowing realistic length trains to be run, as this ex-LNWR 0-8-0 is seen heading towards the station area. At the Warley National Model Railway Exhibition held on the 21st and 22nd November 2009 the LMS Society Trophy was presented by Peter Waterman to Peter Kirmond from Gloucestershire for his splendid 4mm scale Blea Moor layout depicting a remote section of the Settle & Carlisle line in the 1970s era. 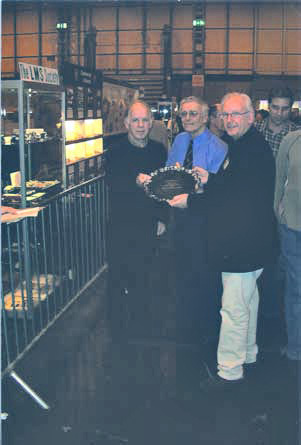 At the Warley National Model Railway Exhibition held on the 22nd and 23rd November 2008 the LMS Society Trophy was presented to John Holden for his 4mm scale, EM gauge layout of Liverpool Lime Street Station. 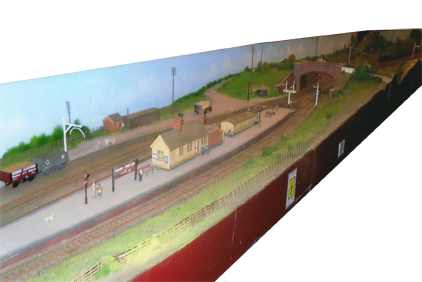 Some very fine models were to be seen running on this layout over the weekend as evidenced by the accompanying photographs. The LMS Society exhibited a good display of models at the Derby 2008 exhibition held over the weekend of 19-20 April. Demonstrations of resin castin and wagon building by members attracted a lot of interest. A total of 3960 people attended the show. The LMS Society trophy was not awarded this year. One large layout exhibited a number of LMS items but close assessment revealed inconsistencies and identifiable mistakes between items, and so the judges decided to side with caution and not issue the award. At the Warley National Model Railway Exhibition held on the 1st and 2nd of December 2007 the LMS Society Trophy was presented to George Godrey of a fine 'O' gauge model of LMS 6233 Duchess of Sutherland. George (left) is pictured above being presented with the award by Pete Waterman (right) and LMS Society Chairman Chris Walker. The LMS Society Trophy was awarded for the first time in 3 years to an excellent 7mm model of 10000 diesel built by George Godfrey, and displayed as part of the 'Camden Shed' layout, which also included several other excellent LMS models. 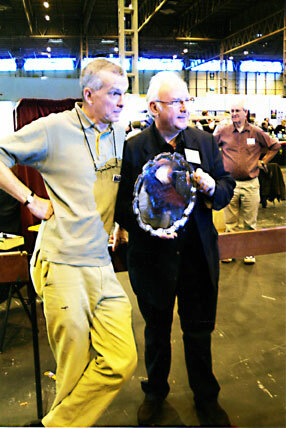 Bill Davis advised that 10000 had won the Gauge 0 Guild Chairman's Cup at the Telford exhibition in September 2006, the first time it had been awarded to a diesel. The new trophy was awarded to Martin Wyatt for an excellent scratch built 7mm scale Royal Scot No.6118 Royal Welch Fusilier, sporting a very credible LMS weathered appearance. It was one of a dozen or so LMS engines on the quite large 'Holiday Haunts' layout, which was the star attraction at the 2006 exhibition, with quite literally the wide passageway between HH and a stand opposite, thronged with on-lookers throughout the show. 'Holiday Haunts' was exhibited by the Pendeford Group of 7mm scale modellers. Two streamlined Coronation locos were part of the LMS stud available for use on the HH layout, with the red version built from an Andrews' kit, whilst enquiries revealed that the blue version had in fact been one of three such streamliners manufactured by apprentices in Crewe works some 30-40 yrs ago. Martin (right) is pictured above receiving the trophy from chairman Chris Walker. The LMS Society award for competition annually at the Warley Exhibition. 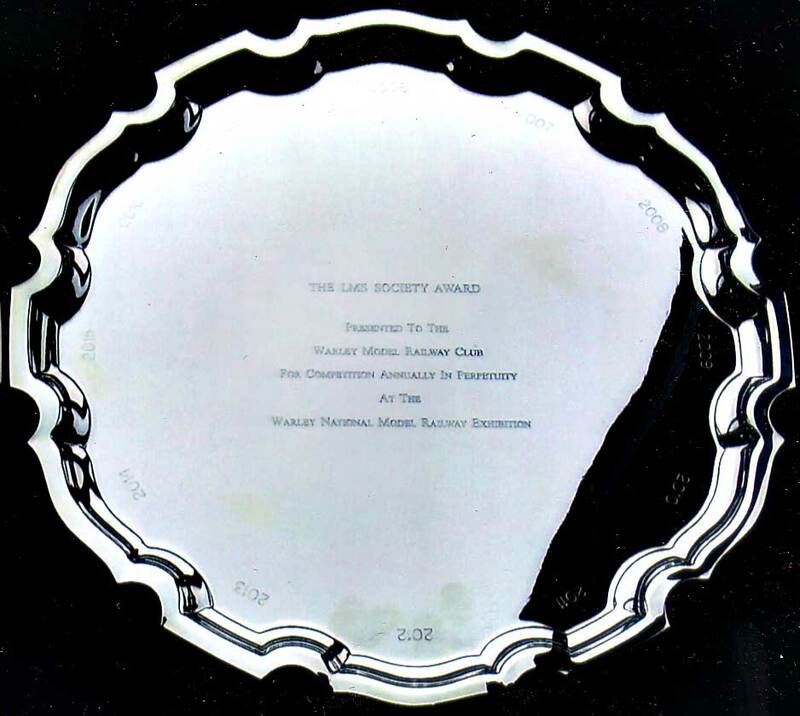 The LMS Society, founded in 1963 to promote interest and research activity in the London Midland & Scottish Railway Company, 1923-1947, has presented a silver trophy to The Warley Model Railway Club, to be competed for annually at the Warley National Model Railway Exhibition, held at the National Exhibition Centre, Birmingham, in December each year. The trophy will be awarded to the best representation in model form of any aspect of the LMS Railway, whether that be a model railway layout depicting the LMS, or an individual model of a prototype item which was in the ownership of, or used by, the LMS Railway Company. An entry form will not be required. All 'items LMS' in the exhibition will be considered by LMS Society members, with details of the winning item advised to the Exhibition Manager by 15.00 hours Saturday. The LMS Society Award competed for annually at the Derby Exhibition. Four members represented the Society - Mark Smith, John Miller, Chris Walker and Nelson Twells (Hon.Sec.) - at the 2006 Derby Exhibition. Mark's demonstrations of resin casting 4mm and 7mm wagon bodies attracted much attention throughout Saturday and there were also a good number of enquiries and comment, particularly on Saturday. Sunday was a quieter day. 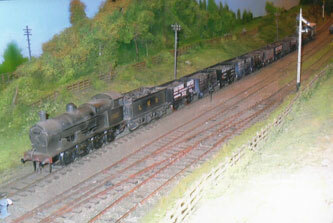 A selection of LMS photographs and models promoted interest. Chris Walker (incoming LMS Society Chairman) remarked it was becoming increasingly evident that there was a lack of scratchbuilding of models primarily because in the smaller scales the range of commercial models was continuing to grow. 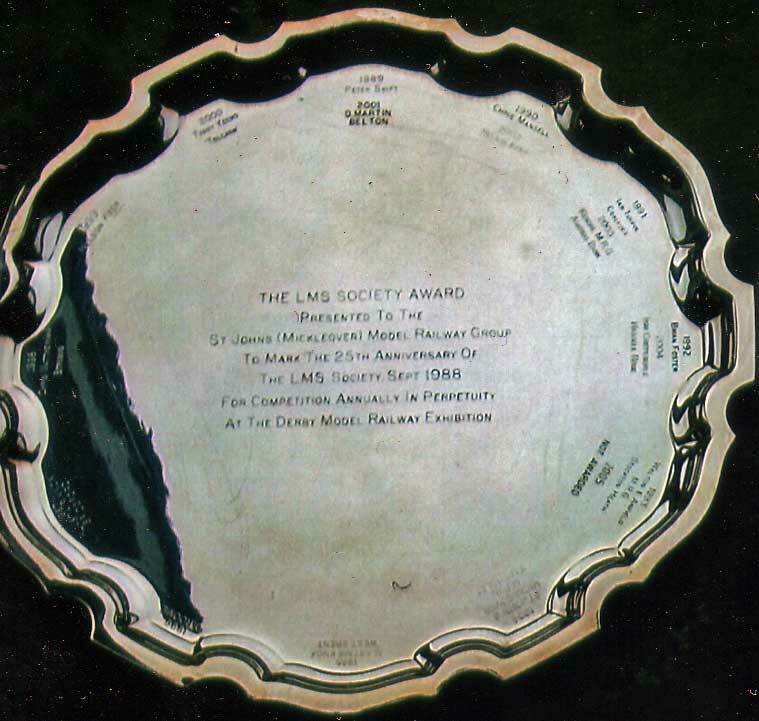 The LMS Society Salver for the best LMS exhibit - layout or model - was not awarded for the second year in a row; last year being the first time ever it had been witheld since the inception of the award. Whilst there were one or two well presented British outline layouts, none were LMS. Subsequently the Society has discussed with the Derby Exhibition Organiser, Stuart Ward, what can be done to get more LMS-based exhibits to Derby. 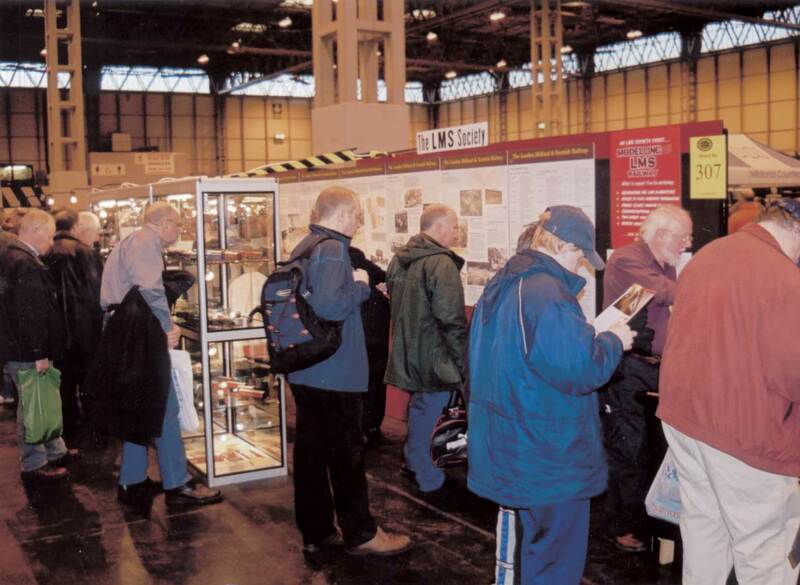 The LMS Society occupied a stand at the 2005 Warley National Model Railway Exhibition held at the NEC Birmingham, on 3rd/4th Dec. The Society's stand displayed various models in two large -level all round showcases backed by a selection of photographs. The LMS Journal stand was next to the Society stand and this proximity worked well, particularly when enquirires required information which was available in one or other of the Wild Swan publications. The same proximity has been requested for the 2006 exhibition. A chance drive-by by a Society member showed the centre intact and apparently functioning normally. Can someone local perhaps supply more detail? Update from the Derby Times 12th November 2005. Groups that use a conference centre in Wilmorton are worried they could be left without anywhere to meet if it closes. Members of the Derby Railway Society were left confused after they were told the group could not use the College of Railway Technology in London Road beyond March next year as it was closing. But Catalis, the firm that runs the centre, says it has no intention of moving and Derbyshire groups will still be able to use the building. Rob Gordon, spokesman for Catalis said: "There are absolutely no plans for us to close the training school. "We are still using it at the moment and plan to continue to do so as we are a growing business. Local groups use the school as a conference centre and that will still be the case. "The landlord has applied for planning permission to develop the building, but we will deal with that as and when it comes to it." London-based Arab Investments was refused planning permission to build 78 houses and 100 flats at the college, now called Catalis Rail Training, in September. Graham Wild (70), a member of The Railway and Canal Historical Society and The Derby Railway Engineers Society said: "The facilities in the centre are very good and if we were to lose them, I don't know where the Society would go." I believe an application has been made to list the above building. I have in the past attended many courses there. It is a good building with several quite unique features. It was, at the time it was built, a very far sighted move in the direction of vocational and management training. I believe it has made a great contribution to history and I am sure that a better use can be found for it, not least, as a much needed centre for training railway personnel of the future. I hope this application may receive sympathetic consideration. Whilst I am the Honorary Secretary of The LMS Society, on whose notepaper I write, this letter is sent from me as an individual, rather than the membership of The LMS Society. I wish to object to the proposals, because they would in my opinion, seriously damage the fabric and persona of this historic building. The building was the very first purpose-built Railway School of Transport built in the United Kingdom, and indeed, in Europe. In 1936, the LMS Railway Company commissioned the LMS School of Transport on London Road, Derby, and it was formally opened by the Chairman of the LMS, Sir Josiah Stamp, on 22nd September 1937. It set the LMS way out ahead of the other three railway companies, in terms of training facilities for railway employees. The other three were way behind the LMS. When the LMS was created on 1st January 1923, following the Railway Grouping by Act of Parliament, it was the largest corporation of any kind in the world. The three early railway companies to reach Derby - the Birmingham & Derby Junction, the North Midland, and the Midland Counties Railway, became part of the Midland Railway in 1844, which was the second largest constituent of the LMS in 1923. The importance of Derby in the development of railways in Britain, cannot be over-estimated. This was underlined, when the very first through passenger carriages from London to the North East, were routed over the London & Birmingham, the Birmingham & Derby Junction to Derby, then on the North Midland to York, and Gt. North of England Railway to Newcastle. The LMS placed great emphasis on training its employees and officers, the results of which were more than borne out in the results the Company achieved. A wide range of subjects were covered, ranging from senior management training, to Carriage Building, Locomotive Construction, Signals & Telegraph, Civil Engineering, Architecture, Research, Marine Transport, and Traffic operations, including courses designed to make the LMS drivers of horses and road motor vehicles much safer on the roads. Such was the thoroughness and attention to training, by the LMS Company, a company which employed more than 220,000 in the pre-2nd World War Britain. The mural in the Dining Room, by William Hamlin himself, was commissioned to mark the 'One Hundred Years', since the formation of the first constituent of the LMS Company. The cinema and lecture theatre was the most up to-date such installation in the United Kingdom. I do not know of any other 1930's building in Derby which could lay claim to being more of a more impressive stature, more industrially important for one of the country's largest employers, than the LMS School of Transport. The presence of two Norman Wilkinson RA., paintings, provides a very historic link for the City of Derby with one of the large murals on the RMS Titantic ship. Mr. Wilkinson painted a mural for the Titanic, as well as being recognised as one of the Royal Academy's notable artists of the period. This former LMS Railway School of Transport, is one of the most impressive and prestigeous buildings remaining in Derby. The facility was used to great effect by the LMS Railway Company before Nationalisation in 1948, as its principal training establishment, and with the present Government inspired emphasis on Learning and Skills training for the workforce, this facility ought to have a modern purpose very near to its original objectives - as a Learning & Skills College. Destruction of any part of this most impressive building would be a savage desecration of one of Derby's most historically important twentieth century purpose built college buildings. I do trust this application to demolish any part of the former LMS Railway School of Transport will be declined by the Planning Committee, and that efforts to find an appropriate future use without any need to alter the existing original structure, will be successful and ensure its continued existence. I would strongly recommend Derby City Council activate procedures, which will ensure this historic and industrially important School of Transport, achieves protected 'listed' status to ensure an unchanged future. I am sure more could be made of this important facility. Yours sincerely, H. N. Twells OBE, Hon.M.Econ., ACIB, MIEX. The LMS Society has completed an index for LMS Journal Issues 0-4. The Index is well detailed and can be accessed on the links below, and whilst the Society reserves copyright, a copy for individual use may be printed off for non-commerical purposes. In addition, a limited Index suitable for binding with issues 0-4 is also available for those who wish to include an index in a bound volume. This Index contains: Issue dates, Author Index, Article Subject Index, Letters by Author, and Letters by Subject. The Society will continue Indexing LMS Journal material from Issue 5 onwards into one progressive Index, thus ensuring there is one continuous index rather than several seperate Indexes, which should be of beneficial for researchers. An Index for each subsequent group of five issues will also be produced, with the one for Issues 5-9 being available shortly. Several members represented the Society at the 2005 Derby Exhibition. '0' gauge models from the Michael Byng collection included an LMS Garrett, a 1946 black liveried 6256 Sir William A. Stanier, a 1st period Full Brake, 1st period brake Composite, and 2nd period brake Composite, whilst a member with 'strange LMS interests' provided several 7mm scale LMS road vehicles. However, the most interesting contribution was unquestionably provided by Mark Smith, who demonstrated the making of cold-cast resin mouldings of 4mm scale wagons. Casting the resin was hourly, with removal of mouldings and fettling on the half hour, and there was no shortage of interested parties throughout Saturday. Noel Coates worked throughout the weekend on wagon and van construction, answering the usual range of questions. The exhibition itself was a combination of British outline, and this year American and Canadian layouts. It was the turn of the North American outline (alternates with European) and there were some fine scenic layouts (given that virtually all non-British items - N. American & European - are ready-to-run items). Such was the dearth of British outline layouts and none LMS, that four N.A. layouts were located in the main hall as well as those in the other large hall. There was a very good East Coast based 'N' gauge layout and several smaller British layouts, but only one of proprietary LMS items. However, very sad to have to report that there was not a single item worthy of consideration for LMS Society Award and at the time-honoured hour of 5pm Saturday, Noel Coates announced that the trophy would not be awarded this year. The Salver will be engraved: 2005 - Not Awarded, to maintain the integrity of this prestigious trophy. Alastair Knox, awarded the trophy on two previous occasions for two quite different 2mm scale LMS West Coast layouts, was exhibiting a 24ft long Canadian Pacific layout set in the Rockies, with mountain scenery and operational matters all excellent. It was jokingly suggested that had he had his 6100 Royal Scot loco with LMS train running through the Rocky terrain, to replicate the 1933 North American Tour train, he might just have completed a hat-trick! Stuart Ward, Derby Exhibition Manager, was very disappointed but acknowledged that the Derby club needed to identify new layouts to bring to Derby next year. Ironically, the overall attendance was up over the two days. Due to unforeseen circumstances the joint British Railway Modelling/LMS Society 'HANDS-ON' Workshop Day will now not take place on March 5, 2005. All participants who had booked a place on the one-day event have been contacted and all deposits refunded. British Railway Modelling and the LMS Society apologise for any inconvenience that this late cancellation may have caused and hope that the event will go ahead at a future date. Several members of the LMS Society attended the 2004 Warley National Model Railway Exhibition held at the NEC Birmingham, on 4th/5th Dec. where various models and artifacts were displayed. Numerous enquiries were received and those which were subsequently immediately resolved were subsequently published in the Society Newsletter for consideration by the wider membership. It was reported that the attedance had exceeded last year's 18300, but what was noticeable was that Saturday seemed to be much busier for longer periods, and the usual fall-off on sunday afternoon did not appear to happen until well after 3pm. Warley provided one large four-shelf illuminated glass showcase for 'O' gauge items and another smaller showcase was used for 4mm models. The 'star' item was an 'O' gauge Garrett loco belonging to member Michael Byng which was frequently photographed and attracted a great deal of attention and comment. It is with much sadness that the LMS Society has to report the passing of its President, David Jenkinson, on 27th April 2004. David died in hospital in York following a short battle with cancer. It has been decided to continue to carry his introduction to the site (home page) which in many ways gives a good flavour of a good man. Once again the Society had a stand at the Derby Model Railway Exhibition to promote interest in the LMS Railway and again much interest was shown in the items displayed and many lively conversations were had. The Chairman had pleasure in presenting the LMS Society Award to Iain Chippendale for his model 'Hassell Rode'. 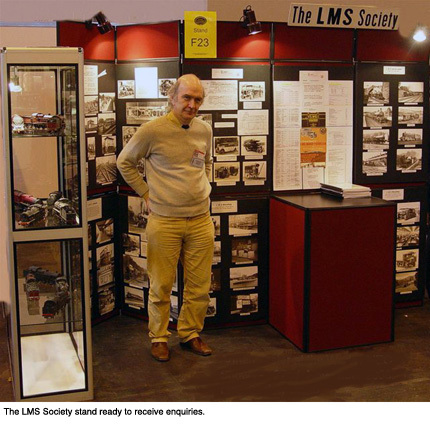 The busy LMS Society Stand at Warley 2003. 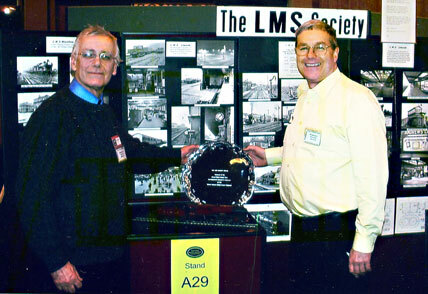 Members of The LMS Society manned the Society's exhibition stand at the Warley National Model Railway Exhibition, held at the National Exhibition Centre in December 2003. An account of the many and varied interests of the LMS Railway Company operations was carried on a series of six boards, displayed as wall panels on the Society's stand, and there was much interest and comment relating to the less well-known aspects of the company's operations. Three all-glass and illuminated showcases are shown in the photographs taken at the exhibition, and models of locomotives, carriages, wagons in both 7mm '0' and 4mm gauges were placed in two of the showcases. A superb 7mm scale model of ex-LMS Coronation class 46247 City of Liverpool in BR red livery, by David Hunt, attracted a great deal of interest and many photographs were taken of it. Other 7mm locomotives displayed were LMS Turbomotive 4-6-2 No. 6202, built by the late John Horton, and a small boilered ex-L&NWR Claughton 4-6-0 in LMS crimson lake livery. A pair of Midland dining carriages and three ex-L&NWR carriages in LMS livery, were also on display. Michael Holland's rake of six LMS wagons, and four LMS six-wheel milk tanks loaned by David White of Slater's Plastikard were also the subject of much interest. The 2nd case contained superbly crafted models of locomotives, carriages and wagons in 4mm scale, all the work of Graham Warburton. His 4mm LMS streamlined Coronation pacific, No. Princess Alice, in the blue and silver livery carried for work on the prestigeous Coronation Scot service which operated from July 1937 to Sept 1939, was the centre of much interest, and many photographs. A rake of Royal Mail postal carriages added further much interest. The third case housed road vehicle models owned and operated by the LMS and some of the pre-group constituents, including the Midland, London & North Western, Lancashire & Yorkshire Railway companies. Included were models of an LMS Crosville Leyland TD1 double decker bus, the original of which was delivered to the LMS owned Crosville bus company in 1929, during the one-year period of LMS ownership (May 1929-April 1930). An Albion PM28 bus model, with body built in Derby Carriage & Wagon Works, was also modelled in 7mm scale, whilst a 6mm 1/50th scale 1926 Midland Red QL type bus from the 'Midland Red Collection' was also displayed - the LMS Railway Company owned a 1/3rd share of the Birmingham & Midland Motor Omnibus Company from 1930 to 1947, when all LMS interests passed into ownership of the nationalised British Railways. One shelf was devoted to war-time models, which included a Spitfire model with an LMS marking on the tailplane to signify it had been repaired in the LMS Derby workshops during the war period. A model of an armoured train comprising two armoured gun wagons, and two ammunition trucks, in camouflage attracted much interest. A 1/1200th scale dock model and models of twelve LMS ships to the same scale, built by deceased member John Hinchliffe, and accompanied by LMS shipping publicity material, also attracted attention. Original LMS artefacts were used in the base of two showcases, whilst a selection of books by members of The LMS Society was displayed in the base of one case. The photographs show the interest generated by the Society's exhibits, and plans are already well in hand for the next Warley exhibition at the NEC - 4/5th December 2006. The Society's aim is to foster interest in all aspects of the LMS Railway, and through the medium of published material by members and attendance at exhibitions, to explain that the LMS was not only the world's largest Joint Stock Company in 1923, but it was also the foremost train operating company. The Society had a stand at the Derby Model Railway Exhibition to promote interest in the LMS Railway. Much interest was shown in the items displayed and many interesting conversations had with members of the public. Several queries were later carried in the Society newsletter and the results from these fed back to the original enquirers. The Society members present decided that the Kendal Model Railway Group was a worthy winner of the LMS Society Award for their 4mm scale layout 'Askrigg Bank'. An Exhibition - "The L M S Railway Company 1923-1947"
The frontage of the LMS 80 Exhibition at the Derby Industrial Museum. 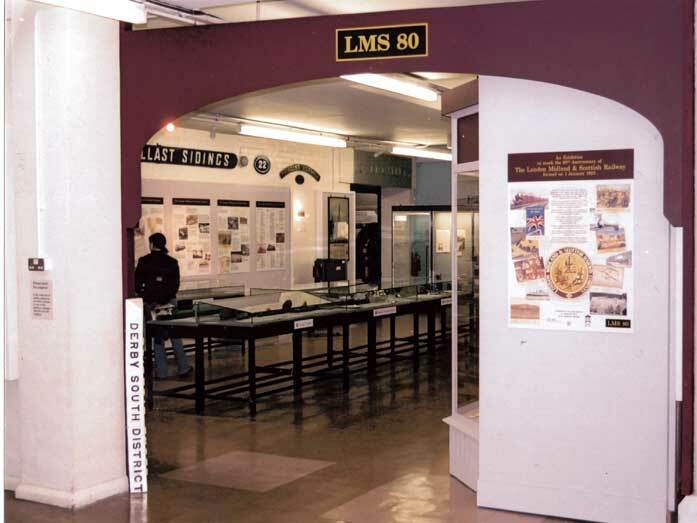 LMS 80 - the largest privately-sourced exhibition at the Derby Industrial Museum attracted a great deal of interest from the public, particularly those with railway connections in the railway city of Derby - so much so that its originally intended run was almost doubled but is now closed. The exhibition was presented by members of The LMS Society, with the kind co-operation of the Derby Industrial Museum, to Commemorate the 80th Anniversary of the formation of the London Midland & Scottish Railway Company, on the 1st January, 1923. The exhibition illustrated and described using original artefacts, scale models, photographs, diagrams and drawings and explanatory text, the many widely differing commercial areas in which the LMS Railway Company chose to operate. The Derby Telegraph 'LMS 80' Special Supplement, published to coincide with the start of the exhibition, has also proved popular with the 10,000 print run sold out. 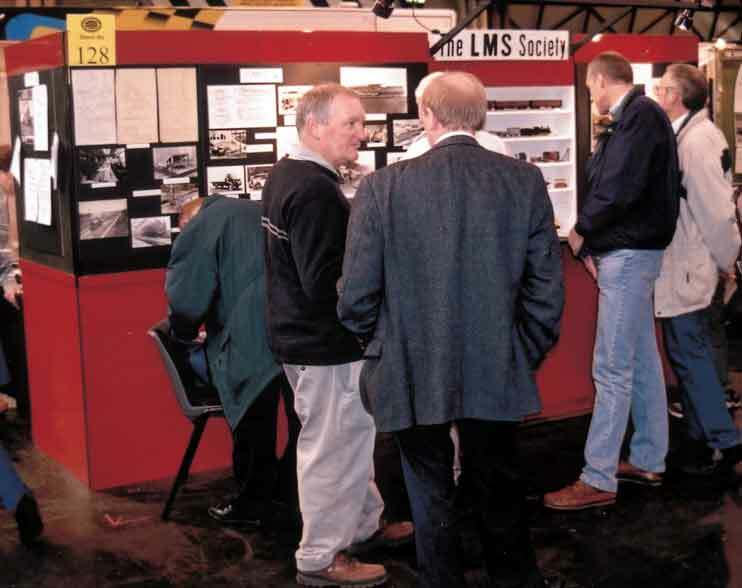 The busy LMS Society Stand at Warley 2002. The LMS Society occupied Stand No. 128 at the 2002 Warley National Model Railway Exhibition held at the NEC Birmingham, on 30 Nov/1 Dec. The Society's stand displayed various models and photographs, with the LMS Society Bibliography of member book and article titles available on the stand. The LMS Backtrack Special Issue by LMS Society members was also available. The stand was busy with many discussions and queries for information received, and several visitors provided snippets of information to add to the Society's/member's records. The reported attendance was 17,600, and the LMS Society is most grateful to the Warley Model Railway Club for the invitation to attend the 2002 show, which lived up to the "national" billing for the event. The LMS Trophy was awarded to Nelson Keen for a rake of four different LMS parcel vans which were well finished. Nelson Keen won the trophy three years ago for an LMS Cream Van and so he was delighted when Noel Coates (Vice-Chairman), standing in for Peter Tatlow (Chairman), presented the trophy at the time-honoured 17.00 hours. Whilst there were other models of LMS prototypes they fell below the standard considered necessary by the members who participated in the judging and Nelson Keen's 4 vehicle rake stood clear of the rest. The LMS Society was represented by six members during the weekend and the Hon.Sec. (Nelson Twells) thanked those who had been present with him - Noel Coates, Keith King, David White, Chris Crofts and Bob Essery. Nelson reported that a good number of copies of the LMS Journal had been sold (via the adjacent LMS Journal stand) but in his view, there was no doubt that the availability of the Journal, had elicited many more enquiries about the LMS than had figured at previous Derby exhibitions. Pages of the Journal had been incorporated into the stand display along with a display of road vehicle models and photographs, lineside equipment photographs, four LMS milk tanks different liveries, and an '0' gauge parallel boiler Royal Scot which Keith King had built. All of this led to many questions and, overall, with the level of interest in the stand particularly evident on Saturday, it was a busy weekend with not so much modelling being done. 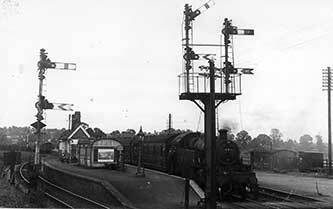 CRESSWELL JUNCTION - Stafford Railway Society. This 'O' gauge layout based in the LMS period up to 1939 represented the ex-LNWR territory in a fictional Midlands setting. A large layout (approx 50ft long), it had a bit of everything. A tightly-configured through station with country branch line therefrom. The 'main-line' disappeared beneath a townscape in one direction, whilst in the other direction it went behind a number of warehouse frontages. The high-level townscape was served by an 'O' gauge tramway. As with all exhibition layouts, 'services' were frequent and the modelling was to a good standard. KIRKBY STEPHEN (Ravenstonedale) - Halifax MRC. 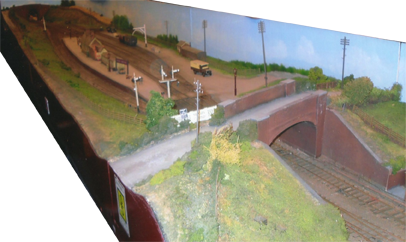 Another 'O' gauge layout with good buildings and scenery, primarily in the Midland era, but with trains from the Midland and LMS periods in operations. One major fault - the Midland boundary fencing (a la Slater's) was painted 'bright' Crimson Lake, rather than creosote brown. The layout looked well (despite the fencing) in very late Midland era, but some items of rolling stock (Midland and LMS) had been finished in questionable liveries. Corridor end-boards in gloss crimson lake - an ex L&YR loco with spacing of the large numerals on the tender too far apart - carriage crest on a tank engine - Midland diamond crest on a full brake, etc. LAMONBY - David Lambourne, Leicester. This L-shaped 'O' gauge layout with private siding traffic dominating freight operations. The whole layout was well-constructed and operated to a good standard but, as with most tight-space layouts, too much in too small an area. BELTON - TT Gauge - David Martin & Ian Harris, Derby. This layout represents an imaginary branchline to the real-life Leicestershire village of Belton, located between Ashby-de-la-Zouch and Hathern. The overall impression was one of a railway in the countryside and to emphasise authenticity the backscene had been created from photocopying original photographs of the real Belton village 'across the fields' then adding colour to reproduce as near an authentic scenic arena as possible. The whole was very convincing, somuchso, that N.T. remarked on the church spire being just like the one at Belton, then the story of the pics emerged. It really did portray the original. However, the ex-LNW style station, the goods shed and the small yard, all looked to fit the part, and all were finished to a high standard. The TT trackwork was built from individually-cut wooden sleepers, with cast chairs, to give a further convincing appearance to add to the whole. Several ex-LNW and ex-MR locos were used and all 'looked right', moreover, they were operated to authentic low speed requirements. Two faults - the ex-LNW signal cabin was too big for the location and the signal gantry outside the tunnel mouth, was not appropriate. That said, the whole presentation was excellent and the modelling was to a very high standard of accuracy and tidiness. Members attending had many thoughts as the day progressed but in the final assessment, it was came down to a majority decision which awarded the Society's Trophy to the TT scale Belton. It had a very believable air of authenticity and achievement to it and well deserved the Trophy. Chairman Peter Tatlow, in making the presentation to the builders, complemented them on the high standards of workmanship and attention to detail in reproducing a very convincing 'railway in the countryside'. Peter, in welcoming the greater number of LMS items at this year's exhibition, as compared to recent years, also complimented the other three layouts and the owners of some of the individual items of rolling stock. Thank are due to the members who represented the Society at the Derby Exhibition - Chairman Peter Tatlow, Noel Coates, Keith King, and David White. The display theme was 'The LMS Contribution to the War Effort'. Three panels of LMS War photos plus Nelson Twell's models of a Matilda tank, a Mk 5 Spitfire (with LMS workshop repair markings on the tail-plane), the four piece Armoured Train, 25pdr Field Gun, (all in 7mm scale), a 4-wheel mounted Anti-Aircraft Gun and a Valentine tank (in 4mm scale), were displayed in support. Keith King provided three excellent 4mm LMS passenger locos, Noel, a 4mm model of an L&Y 0-8-0 (with LNW tender) withdrawn in the early 30's and reinstated in 1939 for war service, and three 'O' gauge LMS Milk Tank models from David White (all Slater's kits). interest was expressed in milk tank services, with a particular interest in 'Independent Milk Supplies' and 'United Dairies' milk tanks. discussions were had regarding modelling the LMS Karrier/Cravens Road-Rail bus in 7mm scale. In addition, a lot of interest shown in the modelling activities by members. The Chairman displayed copies of the LMS NPCS book and again, much interest was shown and many favourable comments were offered. Whilst the Derby Exhibition does not interest all members of the Society, this year's group, who have also effectively represented the Society over the past 10-12 years, enjoy the gathering and the chance to do a 'little more' modelling. The contacts and information received, and the questions asked, made it much more worthwhile this year.